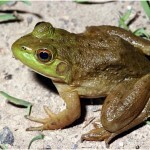 The Bullfrogs are aquatic frogs that are mostly olive green in colour. They are spread over throughout the U.S. They are very noisy and can also be very aggressive in nature. 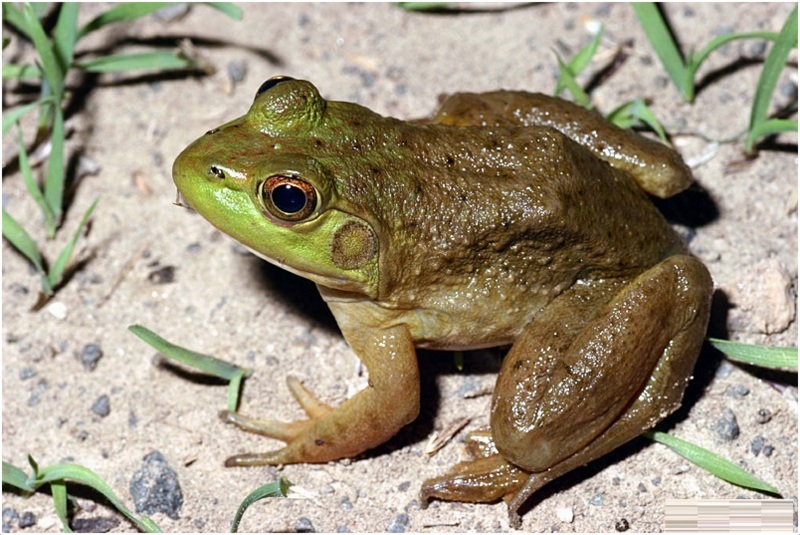 Apart from U.S, bullfrogs are also commonly seen in Asia, South America and Europe. 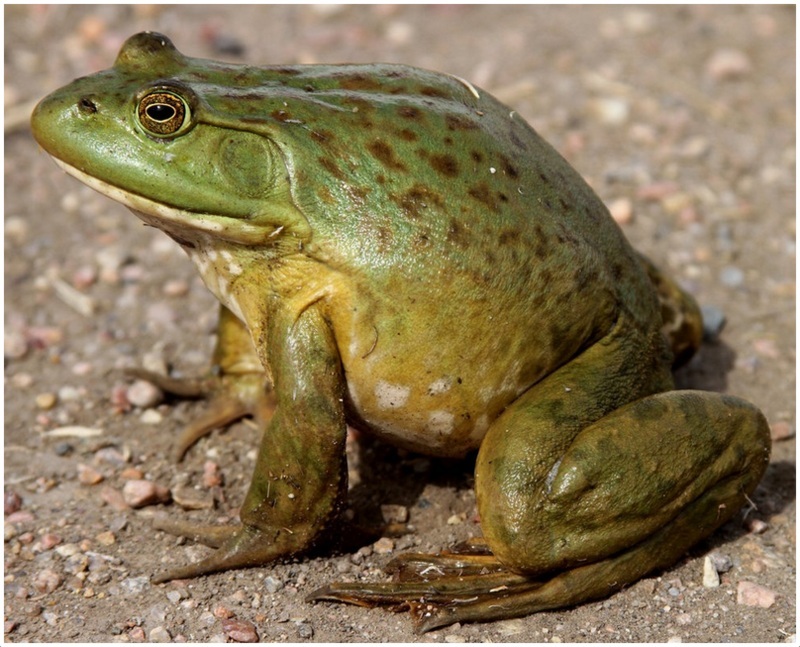 Bullfrogs originated in early 1900s in the region of California and Colorado. They were accidently introduced through trout streams and lakes when Colorado division of wildlife and fish stocking operation were conducted. They normally invade fish tanks and their hatches are mostly found deep down in the seas or rivers. These frogs need special diets that can help them cope up with their low exercise routine. Live insects and worms such as earthworms, mealworms, and crickets are their favourite diet. They are vicious predators and can eat anything and everything that is served to them. 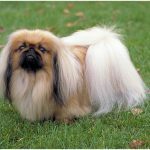 Owner must take care not to feed more than once or twice a day. A regular dose of calcium is also very necessary for them. 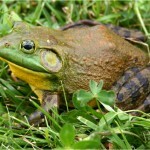 Bullfrogs like to live in water which is why they are usually found near water bodies such as bog, river, lake or ponds. More than cold places bull frogs like to reside in warm, shallow and calm places. Bullfrogs are mostly found in the human societies as because of human presence water gets heated and even more food is available for frogs to eat. Bullfrogs are very aggressive in nature and demonstrate many aggressive traits especially through visual displays. It was studied that posture is a very important factor for bullfrogs to keep their challengers away and also maintain a high social position. 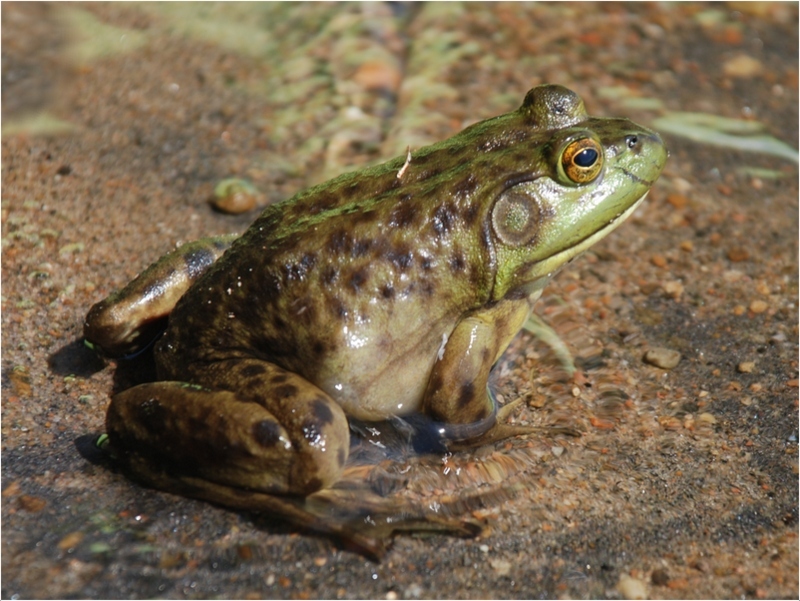 A native bullfrog can usually be seen out of the pond, while a non native one would prefer to stay inside the pond with only its head floating. There are two personalities that can be seen in bullfrogs, in one kind males are very loud while in other kind silent males are seen. 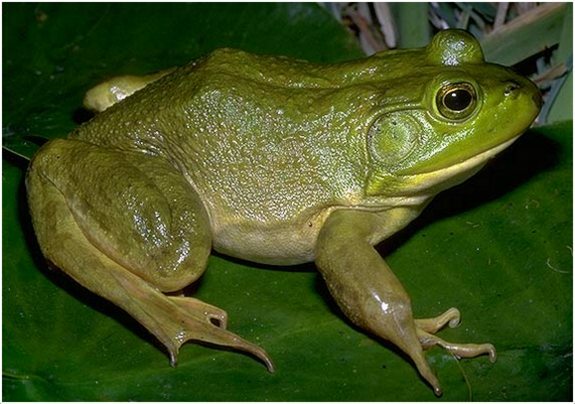 Bull frogs are very aggressive in behaviour and tend to show their dominance by displaying different variety of their coat. They like to be dominant especially around in their habitat and hate interference of another dominant frog in their territory. They are not very friendly. They don’t use a lot of brain and are prone to accidents. They are not good in terms of staying with other aquatic animals. They are the best in regards to adaptability. They do not require a lot of attention and can survive on their own. They require a bigger habitat and cannot stay in closed places. Bull frogs are not very stranger friendly. In terms of grooming, they require a bit of attention. A female bullfrog lays about 20,000 eggs from where life of a bullfrog begins and soon in no time the eggs starts to look like a tadpole. These tadpole have small eyes and its mouth consists of tiny teeth which helps them to feed on the remains of the egg. After about 6 to 7 weeks these tadpole grow a pair of leg and later it takes its shape and looks like a actual frog. In 12 to 16 weeks a completely developed frog is formed. American bullfrogs are themselves predators and feed on insects and worms that are found in the marshy lands near water bodies. But even though they are predators there are many animals that feed on them. 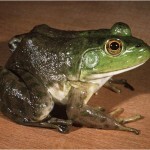 Snakes, birds and variety of fishes will eat small frog as well as tadpoles. 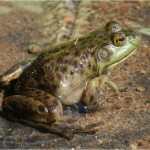 Adult frogs are also consumed by raccoons and great blue herons. 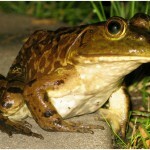 Breeding season of bullfrogs lasts for two to three months it usually starts from early June. In breeding season male frogs is more dominant and usually sits closely to one another. To attract females they make loud noises. Appearance wise they are usually of bottle green colour. Their teeth are very small and are used only in gasping of food. Their eyes are big and are outward projected. Pupil is of almond like shape with brownish irises. 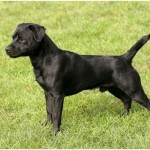 Their backs legs are long and always folded back legs are webbed to ensure that they can swim easily. 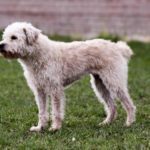 Front legs usually have grey spots on them and are not webbed. Depending upon the surrounding of the frogs their recorded size and weight are different for different areas. 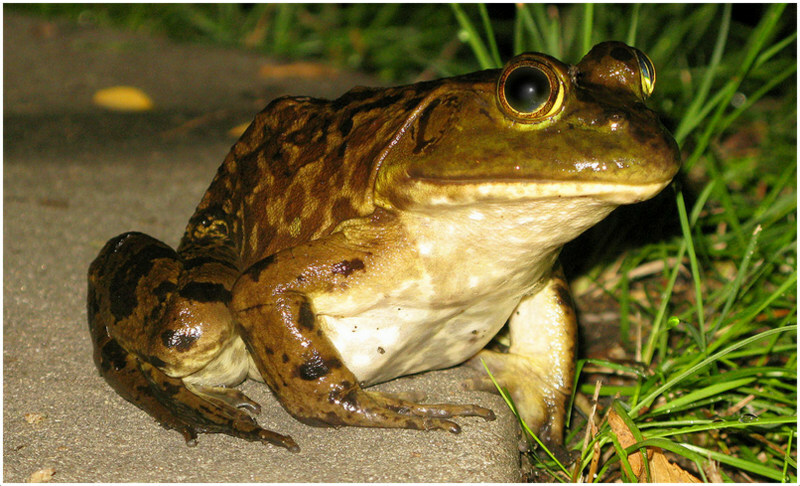 Generally, a bull frog is of height 8 to 16 centimetres if measured from its snout to its vent. Weight wise the new born is only of 5 grams from where they can grow up to 500 grams. 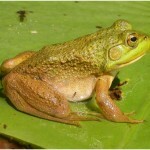 In some of the places bullfrogs of 800 grams are also seen. Color of the coat is something which is very unique to every particular breed of frogs. 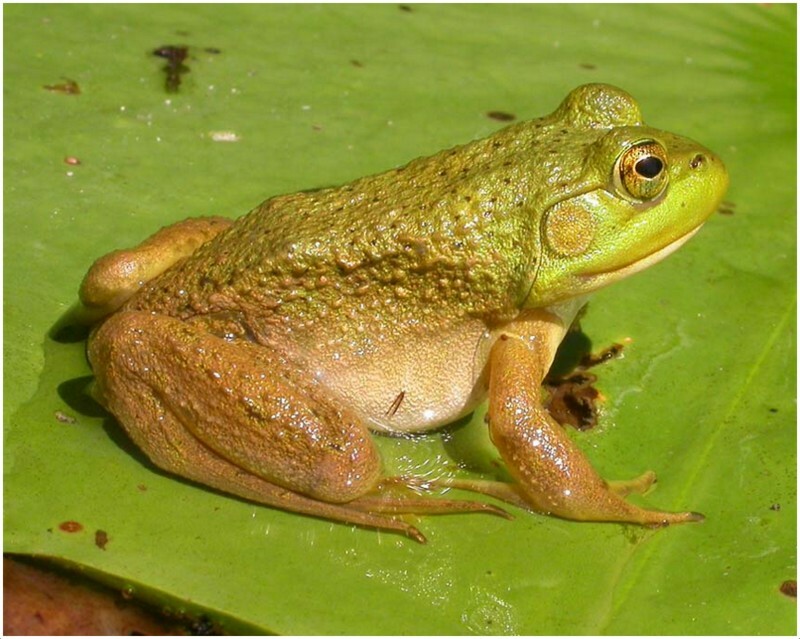 Commonly in bullfrogs bottle green coloured coat is seen which may or may not have brown coloured spots on its back. Downside of a bullfrog usually varies in the shades of white and grey. Life of bullfrog is different for wild and captive kind. 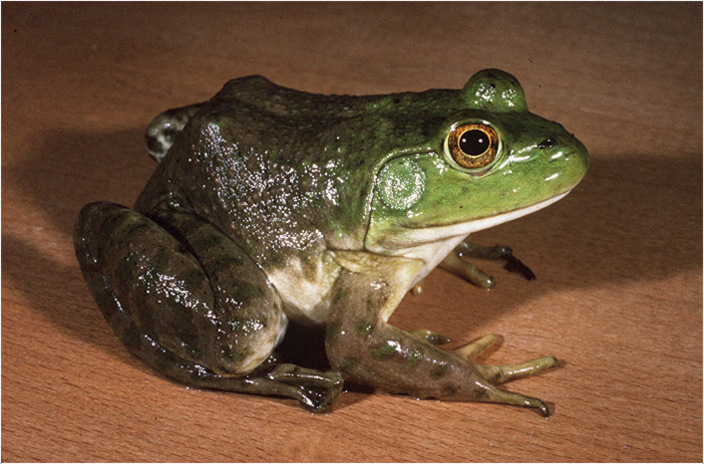 A wild bull frog is seen to live for about 7 to 9 years and a captive bull frog is seen to live for about 16 years. Bullfrogs are normally very bulky in built so over weight can be the biggest health issue with them. They are also very sensitive to heat so it is advised to keep them in cool and clean tank. There are also few issues related to poisoning reported with bull frogs, so a special attention must be given as to what the frog is eating. 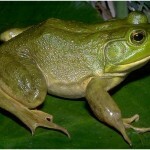 Bull frogs are very active and don’t like to sit at one place for long time. They also love to swim a lot in ponds. They are very bulky by built and require regular exercise to stay healthy and fit. 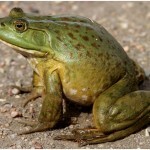 Lot of care has to be taken if you decide on getting a bullfrog as a pet. 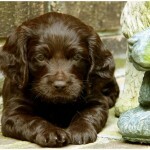 They are not very used to stay in the pond and will require some solid ground along with water. If they are being kept in a transparent fish pond, then it is advised to wrap all the sides of the pond with some kind of paper. Bullfrogs have tendency to jump on the glass in an attempt to get out of water which could hurt them. Proper diet is also very important for bull frogs as most of the times they consume whatever is available. 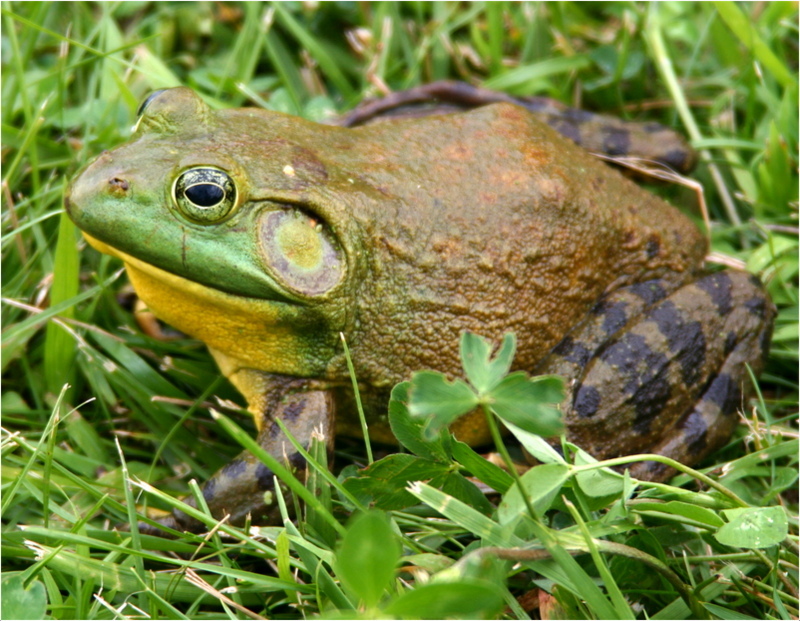 Bull frogs don’t encounter any problems related to shedding.